The light sensor module adaptable to the environment , having a pair of infrared transmitter and receiver, launch tube a certain frequency, infrared , when the obstacle detection direction ( reflection surface ) , the infrared receiver is reflected back by the receiver tube , after processing through the comparator circuit , the green indicator light will illuminate while the signal output interface output digital signal ( a low-level signal ) can be adjusted via potentiometer knob detection distance , the effective distance range 2 ~ 80cm, working voltage is 3.3V- 5V. 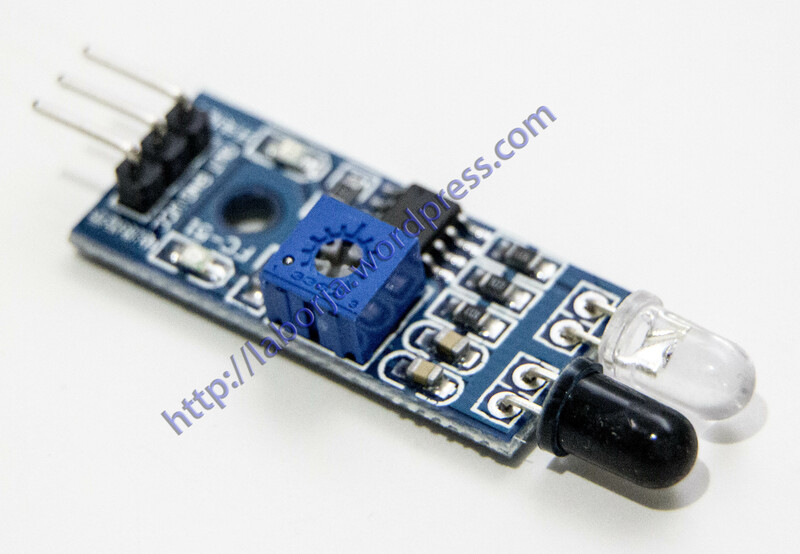 The detection range of the sensor can be adjusted via potentiometer , with little interference , easy to assemble , easy to use , can be widely used in robot obstacle avoidance , obstacle avoidance trolley line counts , and black and white line tracking , and many other occasions . When the module detects an obstacle in front of the signal , the circuit board green indicator light levels while continuing output low signal OUT port , the module detects the distance 2 ~ 60cm, detection angle 35 °, the distance can detect potential control to adjust, adjust potentiometer clockwise , the detection distance increases ; counterclockwise adjustment potentiometer, detection distance decreases. The sensor active infrared reflection survey , so the target reflectivity and shape of the detection range of the key. The minimum detection distance which black and white max ; small area of the object distance is small , a large area from the Grand. Each module is shipped already comparing the threshold voltage adjustable via potentiometer good, non-exceptional circumstances , do not arbitrarily adjust the potentiometer.